At beginning of last season Aaron Banks started out as the second team left guard. As far as the depth chart goes, he was not considered “the next man in” when a player went down. That distinction went to Trevor Ruhland when Tommy Kraemer and Alex Bars suffered injuries. By the end of the season, Banks had earned his way into a starting role permanently replacing Bars at guard. Along the way Banks proved that he can be a building block for the Irish offensive line. The present and the future has looked bright with him working beside left tackle Liam Eichenberg this spring. It’s clear that the two are more comfortable working beside each now compared to when Banks was first promoted to the starting lineup. It certainly doesn’t hurt that he and Eichenberg are tight off the field and they spend time trying to improve even when they aren’t wearing pads. Banks is one of four returning starters on the offensive line this spring with the only new additions to the ones being Jarrett Patterson. He is working at center and has big shoes to fill attempting to replace three-year starter Sam Mustipher, but it’s something that the coaching staff knew could happen near the end of last season. Patterson gained some experience in practice back then and the transition has looked smooth so far. It doesn’t hurt that he and Banks had worked side by side before as backups and it’s made it more comfortable for both of them during Patterson’s transition to playing in the middle of the line. Although the new starter has fit in well, the fact that the starting O-line has only added one new player has helped the four returning starters quite a bit. They are working together well and have been the better group at many open practices when compared with the defensive line. 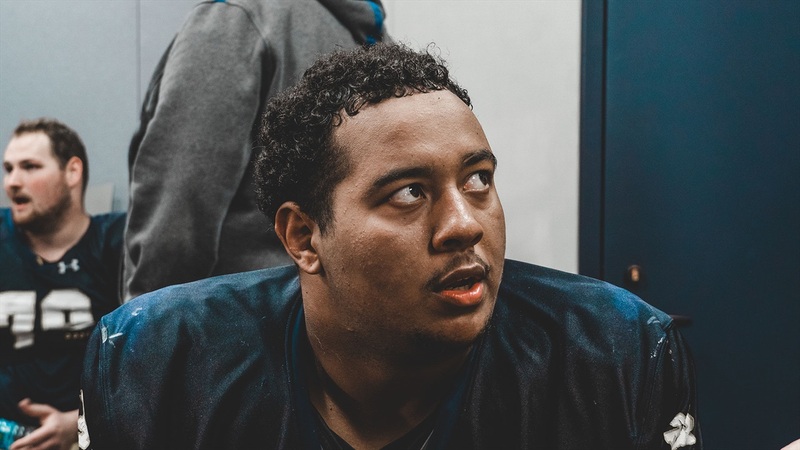 Banks and his fellow linemen are well aware of the challenges the D-line presents to them every practice, but he believes the experience gained from last season has played a big role in the O-line’s success versus the D-line this spring. The O-line wants win all of their battles against opposing D-lines this upcoming season. If the spring is an indication of what’s to come, then they are well on their way to doing so.